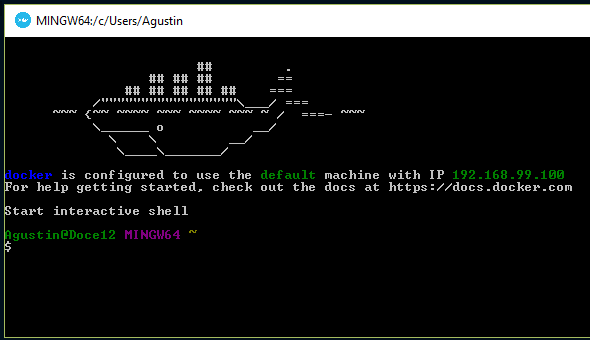 Setting up and troubleshooting our first steps into docker on Windows with Docker Machine. Yopu must probably be fedup already with all the talk about Docker, and how it is the future, how it’s so easy to work with… Well for me it’s just the means to an end. The end is to have a server that resizes and crops images on the fly, storing a cached version to avoid generating it each time. Currently, for this, you can use cloudinary or some other services, but I like to use open source alternatives and to own my own my data. We’ll setup a little server to do so. The first step is done with this guide, get Docker working on your machine. Actually, a simple docker instance is faily simple to have running, but it’s not very flexible or extensible, we will be using some extra sugar to make our magic work. This guide is aimed at windows users, but for most of it, it works also for mac or linux users. Download and install Docker Toolbox, I didn’t have to change anything from the defaults, but check on your case. The cute whale lets you know you have started the default VM and all is ready to go. I din’t like this terminal, so I switched to mine, but that is a matter of taste. Although the default VM is fine, we will do this with a little more complexity. We will create an entirely new machine, as if you already had one virtual machine running with docker, but you want to leave it alone for work projects, this one will be for experimenting and testing things. Let’s call it munich just because that’s where I’m now. I get a list with default and munich. What this means is that it’s setting up the environment to be hooked to the machine you specified, meaning that the docker commands will be run only for that machine. You need to run this on every console window you open. It looks like a hastle, but you get used to it. The repo we are using depends on you having Docker Compose to run several containers to make the server work. Now docker-compose will take care of everything. The first time you run it, it will take a while to download and build the image, from then on, just seconds! The livong Docker promise of fast containers. This command will be your best friend while working with docker. Now you can connect to your machine, from a browser. For that you need your VM’s IP (virtual machine’s IP). with that IP you can make your first call to the fly-image server. This is probably because the folder is not mounted. To comfirm we must access the fpm container, to do that we run a command interactively, which is pretty much the same connecting through SSH. Inside the container if you run ls -la and see an empty folder, then it’s a mounting problem. If you cloned the fly-image repo outside your users folder (C:\Users) you must mount another volume by hand in VirtualBox and then again inside the VM. This gave me the most trouble, the simples solution is to wor in your Documents folder or even your desktop. If you want to go the hard route there are some links at the bottom. If it’s something else you can SSH into your virtual machine. The default password is tcuser. If you moved folders you need to run this process again, so you must stop the VM and start it again. Now you check which containers you have running. Here you get the name of your php-fpm container so you can run commands inside it and check if the mount is working fine. Inside the fpm container we need tu install the PHP dependencies with composer. This operation will take time, even fail a time or two, just run composer update again, it will pick up where it failed. If you keep getting a timeout error like the following. The process "git clone --no-checkout 'https://github.com/sebastianbergmann/phpunit.git' '/var/www/html/vendor/phpunit/phpunit' && cd '/var/www/html/vendor/phpunit/phpunit' && git remote add composer 'https://github.com/sebastianbergmann/phpunit.git' && git fetch composer" exceeded the timeout of 300 seconds. Just increase the timeout to something still reasonable. If you get an image back you are all set. If you always work on the same environment, you can make yourself an alias for the sequence. 5 Useful Docker Tips and Tricks on Windows By Pavel Sklenář.